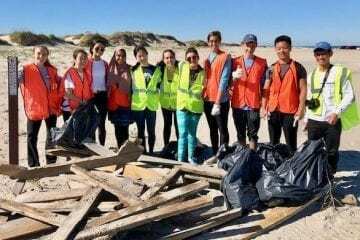 On April 13, from 8 a.m. to noon, Cape Hatteras National Seashore and the North Carolina Beach Buggy Association will host drop-in volunteer beach cleanup efforts. The seashore will host volunteer beach cleanup events at the following locations: Coquina Beach on Bodie Island (meet park staff at the bathhouse); Old Cape Hatteras Lighthouse Site on Hatteras Island (meet park staff in the parking lot); day use area on Ocracoke Island (meet park staff in the parking lot). Trash bags will be provided. Children under the age of 18 must be accompanied by a parent or legal guardian. NCBBA members will be stationed at the park’s off-road vehicle ramps, where visitors can obtain trash bags for collecting litter during their visit. Participants are asked to deposit the trash bags at the ramp entrance for collection. All participants and volunteers are encouraged to bring leather gloves, water, snacks, and sunscreen. Please wear appropriate clothing, such as closed-toe shoes and hats. For more information about Operation Beach Respect, visit NCBBA’s event website or contact Bill King at W illiam.King@ncbba.org. The Music Ministry of Outer Banks Presbyterian Church will present “Alabaster Box,” a musical about the life of Christ, on Saturday, April 13 and Sunday, April 14. Shows for both dates will begin at 5 p.m.
At the April 15 Board of Commissioners meeting, humanitarian recipients were befittingly honored with 2019 Governor’s Volunteer Service Awards, as a result of their exceptional volunteer service.